Stockwell was the location one of the earliest hospitals erected by the Metropolitan Asylums Board which had been set up in 1867 to administer care for certain categories of the sick poor in metropolitan London. 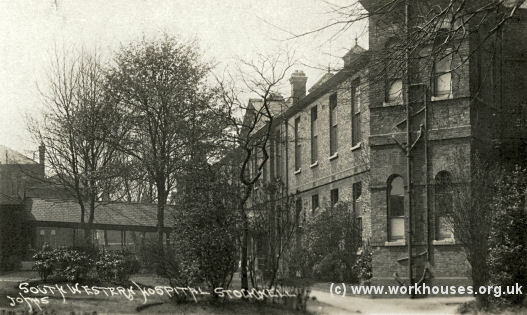 The Stockwell Hospital occupied a 7.5 acre site at the south of Landor Road, which had cost over £15,000 for the land alone. It opened on 31st January 1871, at the height of a smallpox epidemic in the capital. It would have been the MAB's first hospital but an outbreak of relapsing fever the previous year had forced the Board to erect temporary wards on a site at Hampstead. Stockwell was actually two hospitals in one, with a 100-bed smallpox hospital designed by Thomas Henry Wyatt at the north of the site, and a 200-bed fever hospital designed by F Marrable at the south. The site location and layout are shown on the 1888 map below. South Western Hospital site, 1888. ...will be this week ready for the reception of patients. The site comprises 7½ acres, and the dwelling-house, which was included in the property, is now the headquarters of the medical officers and committee, situate in the centre of the ground. The two hospitals are, in fact, completely divided by it. The small-pox hospital will accommodate 102 inmates, in eight wards, each containing a dozen inmates, and there are two special wards for the reception of three each. The fever hospital will accommodate 72 typhus cases, in four wards of 18 each; 48 typhoid or enteric cases, in two wards of 24 each; and 36 scarlet fever cases, in two wards of 18 each. In addition there are 16 special-case wards, each to contain 1 patient. The cost of the two buildings, which is upon the block system, and arranged to afford 2,000 cubic feet of air for each patient is as follows: Site, 15,500l. ; building 50,000l. ; engineering and heating apparatus, 6,000l. ; and furnishing, 5,000l. Special attention has been paid to the corridors, which are wide and lofty, and ins some instances 400 ft. long ; while the wards average 100 ft. long, 28 ft. wide, and 10 ft. high. 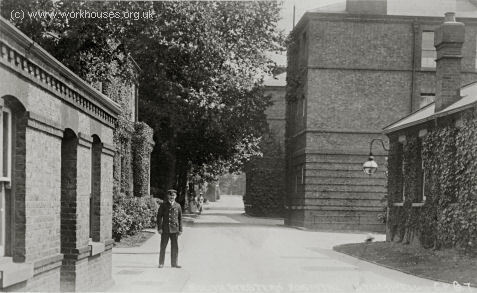 South West Fever Hospital — Landor Road entrance from the north, c.1907. Smallpox ward block at South West Fever Hospital, early 1900s. From 1882, following pressure from local residents, and increasing evidence that smallpox was spread by direct contact with those already infected, hospitals such as Homerton and Stockwell restricted their smallpox admissions to cases living within a radius of one mile. The majority of smallpox patients were then treated on the MAB's hospital ships Atlas, Endymion and Castalia, moored on the Thames near Dartford. From around this time, the Stockewell Hospital was renamed the South Western Hospital. Pash claimed that decisions about the administration of medical treatment had effectively been delegated to the head nurse who ruled the wards with a rod of iron. He also accused the Guardians of putting the saving of money before the interests of the patients. In 1930, administration of the hospital passed to the London County Council. It then had 323 beds plus a nursery unit. The old buildings were demolished when the hospital was rebuilt in the early 1990s. It reopened as the Lambeth and Maudsley NHS Trust and now bears the name Lambeth Hospital.